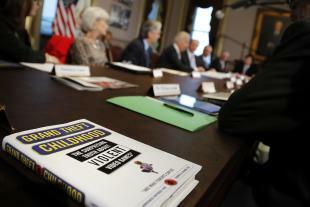 Biden was meeting in the Eisenhower Executive Office Building adjacent to the White House with executives from video game companies whose products have often been blamed for making players insensitive to real-world violence. The vice president has been meeting with government officials, gun-violence victims and their advocates, retailers, Hollywood executives and groups like the National Rifle Association that advocate gun rights. He said earlier this week that he hoped to get his report—commissioned in the aftermath of the elementary school slaughter in Newtown, Conn.—to Obama on Tuesday. His advice is expected to reinforce Obama's calls for Congress to renew the assault weapons ban, toughen background checks and impose new restrictions on purchases of high-capacity ammunition magazines. "I'm shooting for Tuesday. I hope I get it done by then,” he said on Friday, cautioning that "we know that there's no silver bullet." Biden asked whether a “coarsening of our culture” might be partly to blame, but added: "I do not know the answer to that question." The vice president, Attorney General Eric Holder and Health and Human Services Secretary Kathleen Sebelius represented the administration in this week's meetings. The video game industry was represented by officials from such brand-name software companies as Activision Blizzard and Electronic Arts, and retailers like GameStop. There were also researchers from the University of Wisconsin-Madison and Texas A&M University.